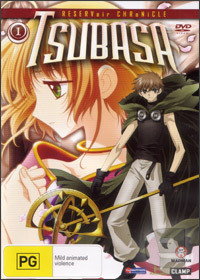 Although Tsubasa may have a long sounding name on DVD, Volume 1 was unfortunately a little too short and just gave the viewer a taste of more things to come. The series revolves around Syaoran, a young archeologist who has fortunately met his soul mate early in his life. Unfortunately for our star crossed lovers, the Princess Sakura is mysterious called to an ancient ruin where her powers soon begin to wake that gives our heroine the ability to traverse dimensions. Things go haywire and before the process can be completed, a nefarious entity sabotages the process and she is sent across dimensions, forever lost. Joined by Kurogane and Fai, Sakura embarks on an epic quest to find his soul mate and bring justice to those who cheated him of his love. This anime tale is your classic sword and sorcery tale that features a very in-depth and engaging storyline, however as early mentioned, once you get drawn into the tale, it's quickly over. Beautifully animated, directed and told, Tsubasa is a tale that can be watched by all lovers of the genre.